So I've been thinking about owner's marks. 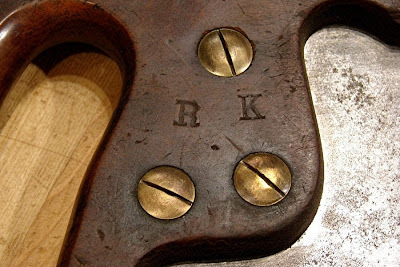 In my shop, it's mostly the older tools that have owner's marks, and the older the tool the more sophisticated the owner's marks tend to be. I think some pictures might help me explain what I mean, so here's a sample series in reverse chronological order - newest first. On this one, I think that the J.A.V.C. 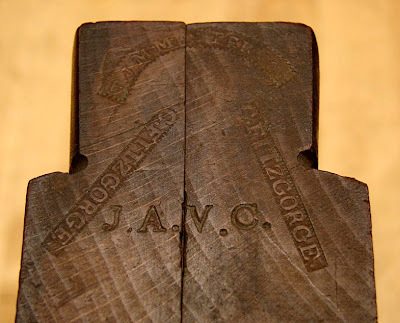 stamp is the older of the two, as it seems Fitzgorge was purposefully avoiding over stamping by using the angles. Which is also interesting, as some owners seemed to be trying to annihilate the names of previous owners with almost violent over stamping. One thing I am curious about is if anyone is marking their tools today. 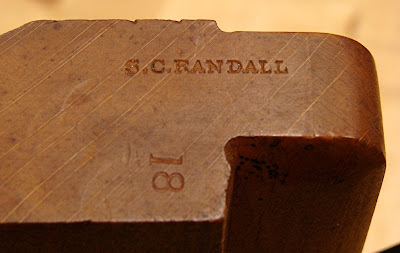 I have a branding iron that I use to mark my shop products and larger tools I make, but I have never made or used an owner's mark. 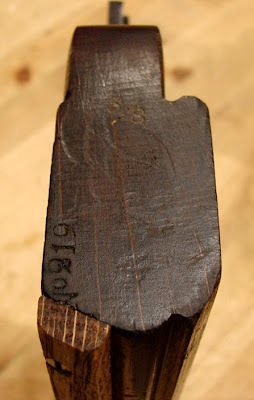 It's a little funny that my initial reaction is not to "hurt" the antique tool by adding my mark to it, when it is the recorded history of owners that makes the tool so fascinating to me. Why shouldn't some future owner look at my mark and wonder who I was and what I might have made with that tool. 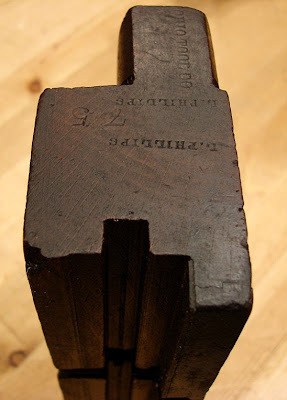 I mean, all the owner marks on the tool where contemporary at one point in time. I've been thinking about making an owner's mark stamp, but to be honest, I don't really have an idea on how to go about it. 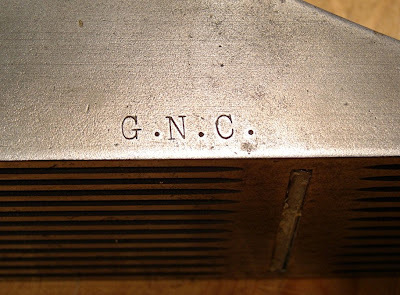 I'm not sure how to carve a tiny version of my name in some kind of metal stamp. Any ideas? Has anyone done this? I bought these two planes on eBay, from separate sellers, about a year apart. 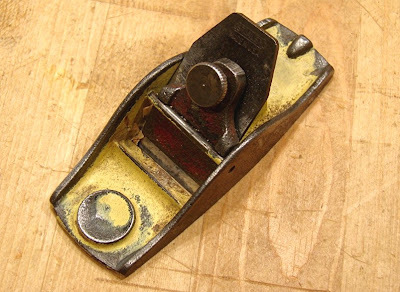 The first is an Ohio Tool Co. #75 one inch tongue plane. 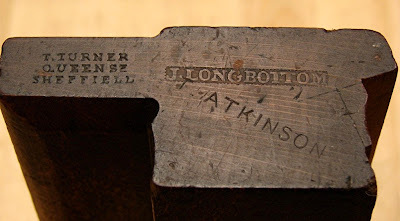 I'm not sure of the age, but judging from the particular version of the maker's mark, and the width of the bevels, I'm pretty sure it is from mid to early in 19th century. 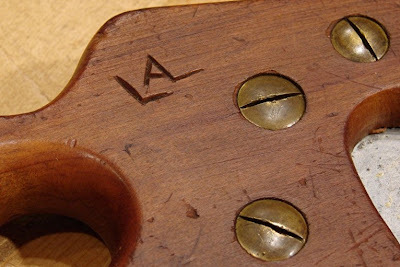 It also has a "L. PHILLIPS" owner's mark stamped in several locations. The second plane is an H. Chapin plane. H. Chapin was the precursor to Chapin/Union Factory, which I believe dates this plane to the first half of the 19th century. I'm not sure how it started out, but it is now a cove plane. You can see in the picture that its sole has been modified - part of the original No. 219 stamp was planed off. When I got it, there were the remnants of a fence attached to the plane. I removed these bits and replaced it with a new fence. It is stamped 3/8, but the cove it cuts is closer to 1/4 of an inch. So, you are probably wondering why I am writing about these two planes. What do they have in common? 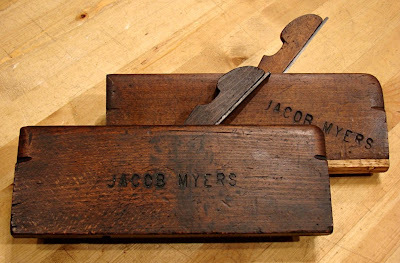 Well, they were both once owned, and presumably used, by one Jacob Myers, who stamped (branded?) his name into both planes. All major projects in the shop are on hold, but several small projects continue to creep along. Here's one of them. I have a set of Narex chisels that I like, except the handles are a little too large for my hands, and the shape doesn't feel quite right. 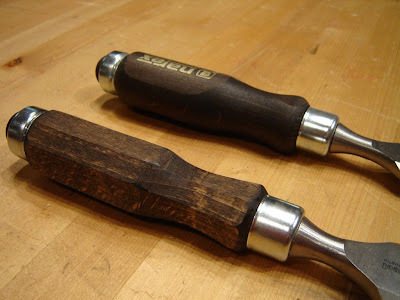 But, being made of wood, the handles are easy to reshape. After covering the business end with several layers of duct tape, I hold the blade in my shavehorse and work the handle with spokeshaves. I prefer a faceted handle (feels "grippyer" to my hand) and it was not hard to change the existing handle into an octagonal shape. The only tricky part was being careful to stay away from the metal ferrules. Only a few are finished, but I can work on them piecemeal as time allows. Anyway, don't be afraid to modify your tools to fit your needs. And if your opponent wears a cape and has a manager in his corner, be afraid. Be very afraid!